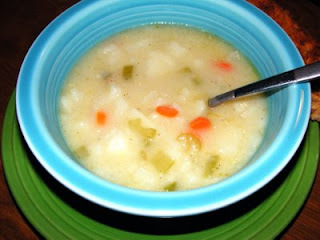 What is better and easier than a pot of potato soup?? There are many versions, some call for milk or cream to be added at the end and some are just a water base soup. I love either one. My husband likes fresh onions chopped and put on top of his bowl of soup. Raven and Ransome like a little bit of crisp bacon crumbled over the top of theirs. Potato soup is comfort food for me no matter how you fix it. I am also including a recipe for Rubber Bread. The recipe comes from my husband’s Grandmother Minnie. Hope you will give these two recipes a try. It is going to be a cool week around Beaty’s Creek, a good time for soup. Melt butter into a large soup pot. Place onions, celery, and carrots into butter. Cook until slightly softened, 5-8 minutes. Add potatoes, salt, pepper and cover with water. Cook on medium heat until veggies are fork tender, 20 minutes. Add your milk. Make slurry of 1 cup of broth from soup and 2 T cornstarch. Pour into soup and stir very well. This will make a more creamy soup. If you want a thin broth don’t add the slurry. Serve with chopped onions and crisp bacon. Pour flour into a large bowl. Make a well in the middle of the flour. Pour water in the well. Mix with hands until it has the feel of biscuit dough. You may need a little more water or flour. Depends on your location. Humidity is a big factor here. Form into flat rounds about 3 inches big. Brown on each side in a cast iron skillet. Serve hot with potato soup or pinto beans.